It's easy to exaggerate the differences in television over the last ten years, but after having navigated the cultural disaster zone that was the '60s, I think it's safe to say there are a few programs on this week that you wouldn't have seen in August, 1961. "Heroes and Heroin" is an ABC News Special on Saturday at 8:30 p.m., hosted by Frank Reynolds. The special is a frank, "chilling" account of the drug addiction problem sweeping the U.S. military. As soldiers return from Vietnam as addicts, both they and the country struggle to cope with the problem, which President Nixon calls "Public Enemy No. 1." Here we are 45 years later, and the drug epidemic seems to be going as strong as ever. At least we treat our returning servicemen and women better than we did when they came back from Vietnam. Also on Saturday, NBC's Saturday Night at the Movies airs a rerun of the brutal Tennessee Williams story "The Night of the Iguana," with a cast that includes Richard Burton, Ava Gardner and Deborah Kerr, and direction by John Huston. It's a frank, adult story that was probably edited to appear on television in the first place, when it made its network debut in 1968. I can't imagine it airing on TV much earlier than that. On Thursday night, NET Playhouse presents a group of five short films that purport to depict the world of the future, "where violence, suppression and irrationality reign." Introduced by novelist Kurt Vonnegut Jr., here is the lineup: "1. 'The Scream.' A '1984'-like tape tracks down a nonconformist. 2. 'The Other Side.' An eerie, omnipotent force terrorizes a town. 3. 'Silo.' Two men, trapped in a missile silo, are at odds over starting a nuclear war. 4. 'The Fall of Varema.' Bleak panorama of a city in ruins. 5. 'Faster, Faster!' Aimless activity is dramatized in witty, fast-paced animation." No matter what your tastes, this had to have made for 90 bleak minutes of television. I probably would have liked it. There are other series appearing throughout the schedule, new and returning, that remind us we're in a new era; The Storefront Lawyers, which by this time has been renamed Men at Law, deals with youth activism in a way you wouldn't have seen back in the days of Father Knows Best. On The Brady Bunch, "Marcia launches a fem-lib campaign," and Dragnet devotes an episode to community-police relations (something which any traditional police drama would probably be dealing with today). And yet, we find reminders that this is one of those odd transition years, when the new and the old coexist on the same schedule. 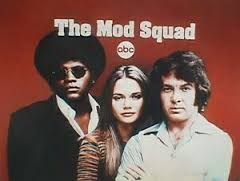 On Tuesday night ABC's The Mod Squad, a series that epitomizes the efforts of the networks to capture the youth demographic with "with-it" programming, goes head-to-head with CBS's The Beverly Hillbillies, a show that dates back to 1962 and always offered a subtle spoof of the trendy and absurd. Room 222, the comedy-drama depicting the struggle in urban schools (more on that later), co-exists with the long-running Western The Virginian, even though the latter is now known as The Men From Shiloh; and iconic shows like Gunsmoke to Bonanza remain popular with viewers. 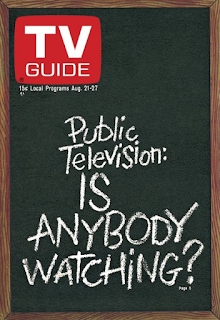 In a way, television was far more egalitarian back then, with a little something for everyone. It had to be, because there was no cable television, no channels devoted to sports or comedy or animals. The VCR was still years away, which meant not only could you not watch your favorite movies and TV shows from years past, you had to be home when your favorite program was shown or try to catch it in reruns, because there was no way to record it. Of course, such was the case in 1961 as well; it's just that some times bring this home more than others. By now both Ed Sullivan and The Hollywood Palace are gone; Palace went off the air last year, while Sullivan aired his final broadcast a couple of months ago, although CBS assures us Ed will be back for several specials each year. This doesn't mean, however, that the variety show is completely dead, as we see Sunday night - in some of the most stark images of the difference between "then" and "now." At 8:30 it's the venerable Red Skelton Show, having moved from CBS to NBC for its final season after running on the Tiffany Network since 1951, and having returned to its original half-hour format. This week, Red's guest is Martha Raye, who joins Red in a trademark sketch, after which he does one of his famed "Silent Spots." Meanwhile, CBS features the type of variety program that replaced Skelton - The Sonny & Cher Show. Their guest is talk-show host and former band singer Merv Griffin, who teams up with Sonny to spoof the Hollywood lifestyle, and sings a couple of numbers. I've made this comment about The Smothers Brothers Show, and I'll say it about Sonny & Cher as well: for all the countercultural vibe that these stars represent, their shows are strikingly conventional, in style and construction, if not in substance. *Like Des O'Connor, the Golddiggers broadcast from London. Other than that, any resemblance is purely coincidental. It's not a variety show per se, but PBS's Evening at Pops has a charming program, with conservative pundit William F. Buckley, Jr. providing the narration (written by Ogden Nash) to Saint-Saëns' classic The Carnival of the Animals. the NFL," but it's the closest I could come. *I also remember the one year it had a network run, which was preempted on our local station for a game show or something like that. I don't have any clearer memories of it; probably the bitterness created a memory block. With the new season only a month away, NFL Action is running full steam ahead, with different episodes appearing on different stations depending on where that station happens to be in the course of the syndicated run. WTVN, Channel 6 in Columbus, has a look at "a young team building for the future" - the Pittsburgh Steelers. The perennial losers have some promising players in the lineup for 1971, including quarterback Terry Bradshaw, defensive tackle "Mean" Joe Greene and running back Rocky Bleier. In 1972, they'll add running back Franco Harris; a couple of years after that it's wide receiver Lynn Swann. The rest, as they say, is history. Meanwhile, WEWS, Channel 5 in Cleveland, has a look back at the "Sensational Sixties," and there's a lot of it - the Green Bay Packers, winners of five championships in the decade; Johnny Unitas, one of the game's greatest quarterbacks; Jim Brown and Gale Sayers, two of its greatest running backs; and the advent of the Super Bowl, America's greatest religious experience. And WSTV, Channel 9 in Steubenville, looks at the 1970 NFC Champion Minnesota Vikings, whose great claim to fame is that of being the last NFL champion prior to the merger - and, since they lost the Super Bowl to the AFL champion Kansas City Chiefs, the last NFL champion who wasn't really the champion. In the days before constant coverage of the NFL on every network, before the NFL started its own network, NFL Action was one of the few chances to see many of the teams other than your own home team. In many times, it was a better, less saturated time. Good memories. 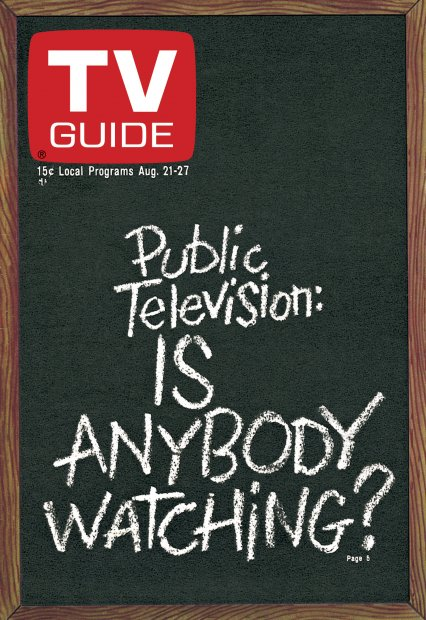 Since it's the cover story, I suppose we should ask the same question: is, in fact, anyone watching PBS? One survey finds that most viewers see PBS "not as a medium for 'the people' but rather as a segregated vehicle for the higher-educated segment of the population, and a little left of center." Probably the same could be said of PBS today, except much of the "higher-educated" content has been replaced by pledge breaks dominated by nostalgic boomer-music groups. PBS's most popular program, by a long shot, is Sesame Street, which attracts as much as 40% of the viewing audience in some markets. Why the awards and critical acclaim can't translate to more viewers is a mystery, though, not only to PBS but to other networks as well. "I don't know, I just don't know," one top programmer says. One reason could be that many public television stations have been consigned to hard-to-find UHF channels (even FCC Chairman Dean Burch can't pick up Sesame Street on his home television). The network has also struggled to develop traditional "series" television, relying mostly on "anthologies" such as Masterpiece Theatre and documentaries like Civilisation. Without regular stars to tune in to every week, viewers may feel less attachment to the network's shows. Speaking of which, there's a sheer lack of programming, at least when compared to other networks; while each of the big three provide 21 hours of prime-time programming per week, PBS can only manage 13, plus its daytime feed. Whatever the cause, PBS officials say they're not about to fall into the ratings-game trap. 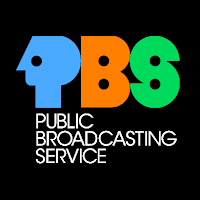 Says David Davis, a representative of the Ford Foundation (one of PBS's major funders), "You might destroy public broadcasting if you tried." He adds, though, that he wouldn't mind finding out how PBS might at least attract a few more viewers - a sentiment echoed by many at the network. It doesn't explain, though, why one of the most British series possible, the miniseries The Six Wives of Henry VIII, has become such an unexpected hit - on CBS. The unedited version appears next season on Masterpiece Theatre. Care for a little comic relief? There's the story of Dora Hall, the woman whose husband literally bought her a television show. I can't bear to recoup the details; you can read a fine article about her here. Finally, the weekly ad from the back cover. 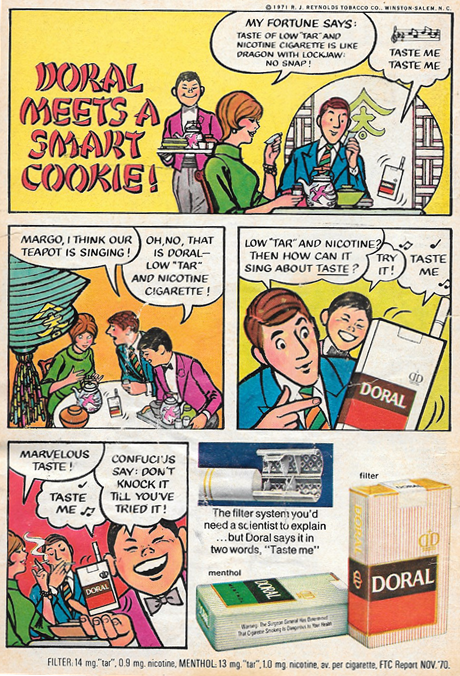 I'm not sure what would be considered the greater crime today: the smoking, or the Chinese stereotype. As much as the difference between 1961 and 1971, that's the difference between 1971 and today. In the summer of '71, Dean Martin's summer replacement was his Summer Show from four years previously, the one hosted by Vic Damone. The Golddiggers In London, which introduced Marty Feldman to US TV, ran the previous summer, 1970. Every prime time reference book I've got confirms this; so does my memory. have you heard the one about how there used to be a street named after Chuck Norris? It had to be changed, because nobody crosses Chuck Norris and lives. Ironically those are now considered 'old jokes'. In '08 while running for Prez, Mike Huckabee had Norris on one of his TV ads. Just sitting there, facing the camera with a stern look on his face. While Huckabee told ''Chuck Norris fact'' after ''Chuck Norris fact''. For the NFL pic if you were aiming for '71 you were pretty close! I can date the time period from the helmets. While the NFL-AFL merger was made official in the 1970 season (it actually happened in 1966, beginning the Super Bowl era, but the two weren't unified until 1970) the second clue is the Buffalo Bills helmet on the left. It's the original design, it became the more stylized buffalo in '78 IIRC. The third clue is no Seattle Seahawk or Tampa Bay Buccaneer helmets - they didn't begin play until 1976. The reason PBS rarely had home grown programing, other than news, is because the government starved it of funds. The reason BBC had programs is because the government had funding that the BBC received. The reason that their endless pledge drives and is that there was no sustaining funds. We as a culture are afraid of anything that isn't driven by money. I'm not against a free market driven economy. But sometimes there might be a different way to do things then always depend on capitalism. By the way I like your blog and read it everyday to not only for your articles but also for your sidebar pf other blogs. Really a snapshot in time: The Beverly Hillbillies, Red Skelton, and The Men from Shiloh (aka the Virginian) were about to leave the air within a month, with just a rerun or two to go. Green Acres, also. Mayberry RFD was also leaving, despite ranking 15th in the Nielsens. The "singing" "Taste Me" cigarette pack in the Doral ad had been a singing commercial for Doral before cigarette commercials on TV and radio were outlawed. R.J. Reynolds hoped that enough people still recalled their jingle that a print version could be successful. MASTERPIECE THEATRE and NET PLAYHOUSE (as interesting a mixed bag as that episode might be...NET PLAYHOUSE would soon (1972) do the Vonnegut reworking of several stories into "Between Time and Timbuktu, or Prometheus-5: A Space Fantasy" (produced by the same team that would make under commission by PBS the fine earlier telefilm of Ursula Le Guin's THE LATHE OF HEAVEN (the later SyFy Channel film was terrible) and the sadly poor adaptation of John Varley's "Overdrawn at the Memory Bank"--a good story, but a very awkward episode of AMERICAN PLAYHOUSE, and most visible these days as MYSTERY SCIENCE THEATER 3000 episode). THE GREAT AMERICAN DREAM MACHINE was also popping up about then, as one of the series that really caught my attention as a young tv viewer (this was about the time I was starting to pick out my own programming, perhaps a year of so earlier..such notable series as AN AMERICAN FAMILY and NOVA were coming soon. 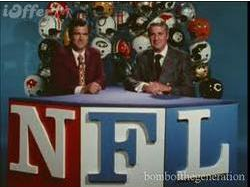 And NFL Films productions were wonderful...I've never been much of a football fan, but their productions were wonderful. Hm. Tried to replace that last redundant "wonderful" but something flaked in the interface with my computer. That last was to be a reference to how THE NATIONAL GEOGRAPHIC SPECIALS debuted on PBS with "The Incredible Machine" (after having played on commercial networks, longest on CBS) in 1976, and was a ratings record-breaker for PBS at that time.